Caption slip reads: "Photographer:Emery. Date: 1957-03-09. Reporter: Frank Petty. Assignment: Dig up ancient Indian bones. 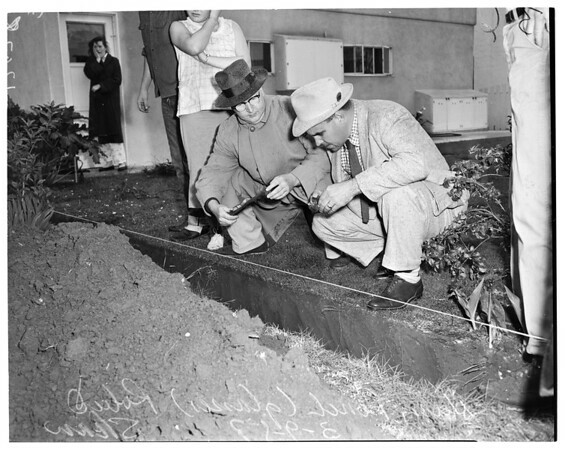 36/37: LBPD homicide detectives Robert Shaw (left) and Harry Finch (with glasses) examining jaw bone and arm bone, part of skeleton found buried in backyard at 48 Ellis Street, North Long Beach, believed 500-year old Indian grave. Group around "diggins" throwing big tarpaulin over scene to preserve site for Long Beach State College anthropology class which will carefully dig up & preserve bones, shells etc for schools early Calif. museum".